EZ Input is a simple, easy to use, but very powerful software package, which works together with EZ Commander to give PC users an innovative multimedia experience like never before. EZ Input supports EZ Commander in two different ways – PC mode and Media mode. Users can switch easily between these two working modes by pressing the PC or Media key. Indicates current mode is PC (text input) mode. Indicates input language is “Number”. “Number” is the default language when you first switch to PC mode. Now you can type in only numbers with number keys on the EZ Commander. It’s like a standby mode for EZ Input. → Press the PC key again to open the EZ Input dialogue window. 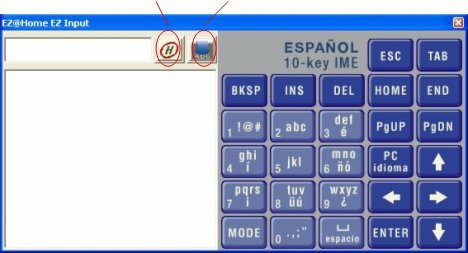 By default, the English 10-key input keypad will appear in the window, and the tray icon will indicate the status as follows. For details about how to input English text into your working application, please refer to the Multilingual Text Input section in this guide. Indicates the input language is “English”. →Press MODE key to switch input mode between en, En, and EN, which represent normal, Leading Uppercase, and UPPERCASE respectively. In en mode (default), the input word is typed into the working application without any change. In En mode, the first letter will be uppercase. In EN mode, the whole input word will be changed to uppercase. →To input numbers instead of the word (e.g. to input "74992" instead of "pizza"), just mouse clicks on the input numbers (e.g. "74992") directly. The numbers (e.g. "74992") will be typed into the working application. →To type the words or numbers into your working application properly, please make sure your application is the active window and move the cursor to the correct input position. 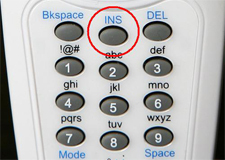 Once you have finished the text input, you may press ESC key to close the dialogue window and switch back to “Number” input (standby) status. 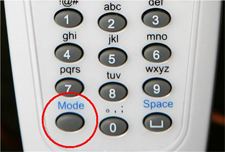 Indicates the current mode is Media (remote control) mode. 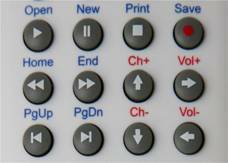 Press the control keys (as shown on the right) to control your media software to playback contents, surf Internet, or manage presentations. 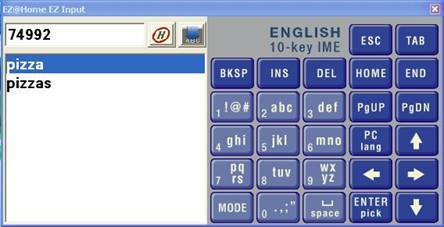 EZ Input has a built-in code book that records control hot key for most of the popular media software. It is stored in the file “EZInput.ini” in a text friendly format. Users may edit the file and attach a new key book for their favorite application. → For software supported by EZ Input, please look at the Media Software Key Mapping Support List. → Press INS key (as shown on the right) to switch between programs on the taskbar. 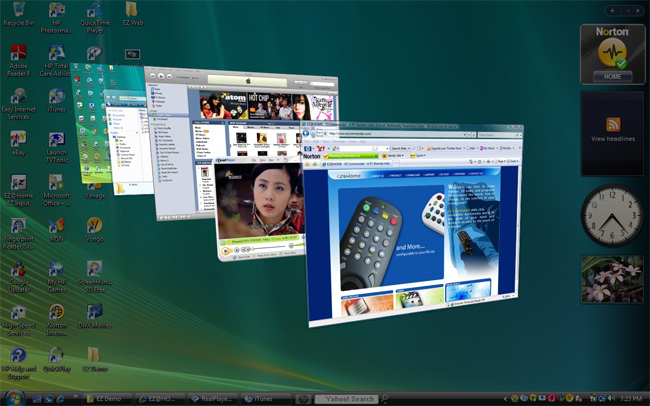 → For Windows Vista users, press INS key to cycle through programs on the taskbar by using Windows Flip 3-D (as shown in the following picture). Press Enter key to select your working program and switch back to the desktop. → Press Mode key (as shown on the right) to switch to Windows desktop any time when you want to select a desktop icon. → For Windows Vista or MCE users, press Mode key to switch the PC to Windows Media Center mode (as shown in the following picture). 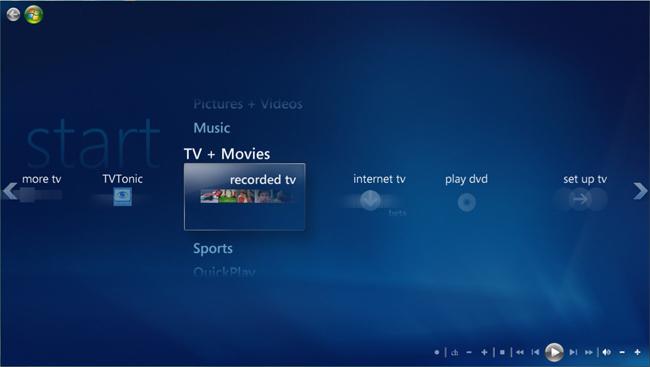 This is an integrated multimedia environment provided by Microsoft for PC Home Entertainment. → For a complete software flow chart, please look at the EZ Input Software Diagram. → Mouse click the help button ( ) on the EZ Input dialogue window as follows. This help system will appear for your review. → Mouse click the On-Screen keyboard button ( ) on the EZ Input dialogue window as above. The EZ Input dialogue window will close, and the On-Screen Keyboard will show up. Users can mouse click on each letter or function key to do the text input.